British Columbia – one of the British colonies of British in Canada issued its first Independent stamp in the year 1965, five years after the first stamp issued in the colony. The Colonies of Vancouver Island and British Columbia, in 1860, issued a postage stamp inscribed with both the names of British Columbia and Vancouver Island. Vancouver Island adopted decimal currency issuing its own stamps in September 1865 where as British Columbia issued its first Independent stamp in 1965. 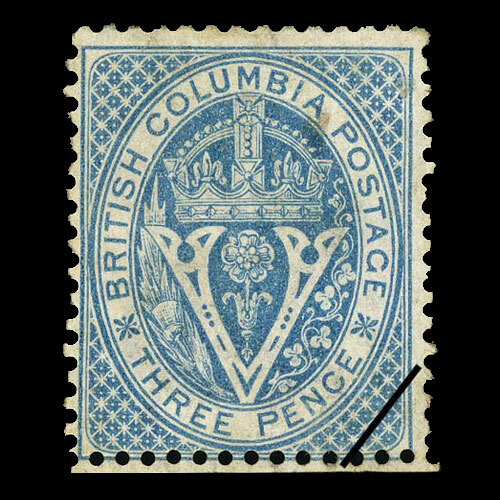 The independent issue of British Columbia is a beautiful blue stamp with the denomination of 3Pence. The stamp features letter “V” in the middle flanked by a floral and a grass like design with a flower between. The letter “V” is topped with a Crown. The Entire design is within an oval vignette inscribed with “BRITISH COLUMBIA POSTAGE” and “THREE PENCE”. The stamp is known as the ‘Seal type’ stamp of British Columbia. This design was continued till July 20, 1871 when British Columbia joined the Dominion of Canada.